The other day Khloe was upset because the boys - Kerry and his friend Jacob - wouldn't play with her. I tried everything to settle her down. Nothing worked until I asked if she wanted to do some sewing. 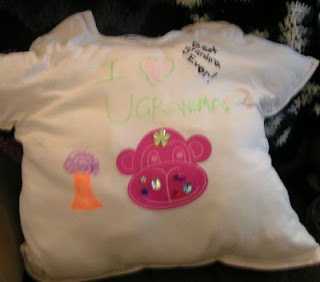 I thought we'd do some tee shirt recons but she, of course, had another idea: a tee shirt pillow for Grandma. It's kind of big and a bit lumpy but very squishy - perfect for Grandma to nap on!